Southern (California) Belle: Happy Halloween! The big day is finally here! To be honest, I've been so overwhelmed with life changes this past week that I was unsure if I'd be able to enjoy Halloween. Thankfully, the craziness has died down and will stay that way until about Wednesday. Then it's off to prep for the move! But you best believe that I'll be enjoying the day with my Princess Tiana and my, I mean her, candy. If you don't own a Little Jun skirt yet my first question would be why? It's just the perfect addition to any wardrobe. The wide waistband is figure flattering and the elastic panels on the back allow a tailor-made fit. The box pleats create a beautiful silhouette and the massive pockets are a huge plus. It's also a welcomed change from the classic Jenny skirt. It's not nearly as much fabric and has a shorter length. So for those who aren't super into the pinup wardrobe: this skirt is for you too! 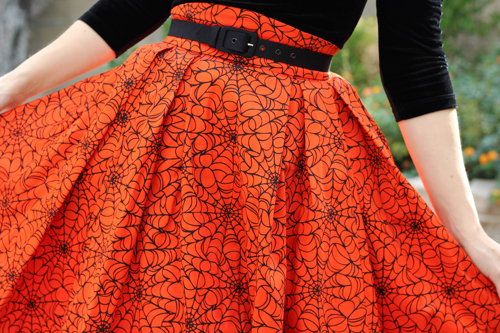 I had to wear the orange with black spiderweb print for holiday today, but this skirt comes in a plethora of colors and prints. I would know: I think I might have them all! I hope you enjoy Halloween in a fun but safe manner! I'll be accompanying Bianca on her trick-or-treat adventures with some of her friends. I can guarantee there will be lots of pictures posted on my Instagram. What are your plans today? Let me know in the comments below!